Until now, I categorized myself as South Asian but I always felt that the term South Asian represented the dominant group of that subcontinent, India. I am South Asian and Nepalese; the Nepalese language is similar to Hindi but Newari, my ethnic language, is closer to Tibetan and Burmese. So Himalayan is a more accurate descriptor of my culture and ethnicity. > Having the term Himalayan American to describe myself strengthens my identity and allows me to explore what makes us a community and how we can strengthen that network. But I am also still South Asian and Asian American because there I enjoy being associated to these larger communities for both political and social reasons. …What does it mean to be Himalayan American? Do we need this term to better describe ourselves? Why not Asian American or South Asian American? 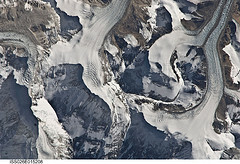 The answer lies in the mountain range that connects Bhutan, Nepal and Tibet, the Himalayas. Read the rest of Sakya’s post to find out more about what it means to her to be Himalayan American and some of the stereotypes of the Himalayas that she has encountered. She also mentions an upcoming Himalayan Youth Leadership Summit (pdf) in Oakland, California. The summit is organized by Sahayeta, a non-profit organization providing free primary health care and other services for people in the northern California Himalayan community. This entry was posted in Blog, Community, Identity by Pavani. Bookmark the permalink.